On Thursday, April 4, more than 250 elementary, middle and high school students from parochial and public area schools participated in a moving anti-bullying conference and story slam at Concordia University Wisconsin. The goal of the conference was for these students to showcase what they learned from CUW faculty and students about bullying and affirmations. The event was the culmination of a year of planning by a task force led by Concordia faculty, Psychology students, and Psychologists from the Wisconsin Psychological Association. According to recent statistics, one out of four students report being bullied, and the majority of instances happen in middle school. Senior Rebecca Hasbani, Psychology Club president, was determined to do something to help prevent bullying. Motivated by her Christian calling, she created this conference as part of her Psychology Legacy project. She enlisted the help of her advisor, Professor Tracy Tuffey, and, together, they reached out to several other professors, hundreds of students, and community experts to support Rebecca’s vision. “My goal for the project was to help young people develop their voices and then give them a powerful platform so that they can use what they’ve learned to stand up to bullies and shift the narratives in their own schools,” says Hasbani. Prior to the conference, Concordia faculty and students spent a semester visiting Our Redeemer Lutheran, Heritage Christian, and Maple Tree schools to teach students about bullying and how to use their words to help build more affirming communities. 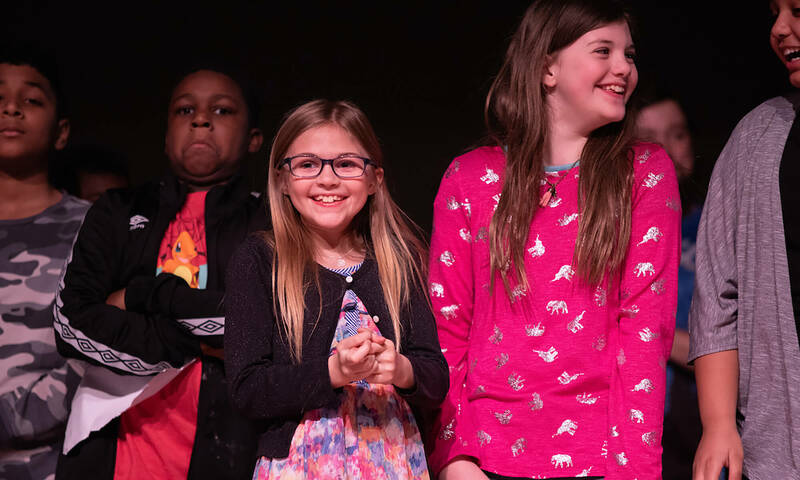 One of the classroom activities was a writing workshop where students were invited to write poems and stories that they could perform on stage during the story slam. Under the guidance of Concordia professors Eugene Pitchford III and Lori Woodall, roughly 20 students accepted that invitation and worked diligently to be ready to perform. Poet Cedric Dale Hoard fires up the crowd. The conference started with a powerful message from Pastor Leon Jameson of Hales Corners Lutheran Church. He reminded the students that they were masterpieces purposely, perfectly created by God. He went on to explain that, as masterpieces, they were meant to stand out and couldn’t be broken or damaged by others. Jameson’s powerful words set the artful tone for the rest of the day. Hales Corners fifth grader, Sydney Jameson next took the stage and expressed her voice through a moving solo ballet performance. High School students, Jabarri Bradshaw and Ebony Loren also captivated the audience by performing a song written to help reach students who feel hopeless as result of being bullied. Spoken word artist Cedric Dale Hoard was next on the agenda. 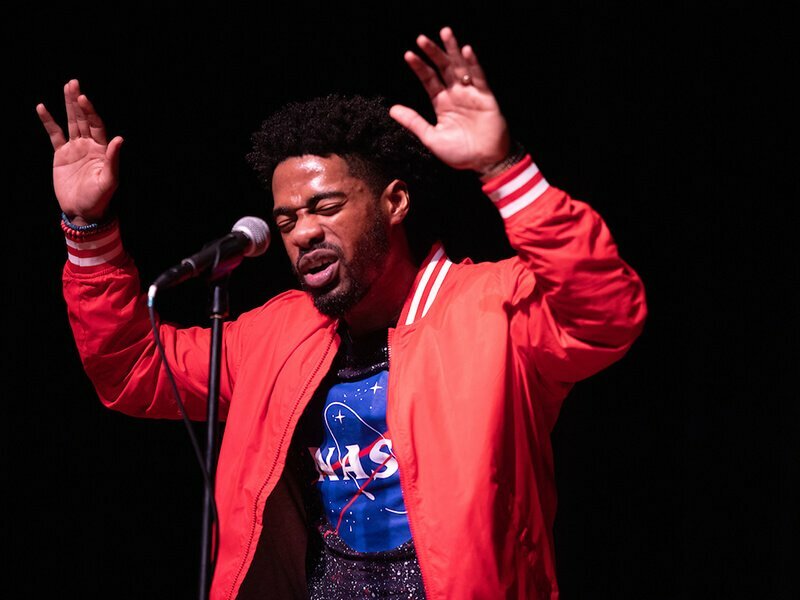 Hoard, a mental health therapist and inspiring poet, used his artistry to help students understand the lasting and devastating effects of bullying. His powerful words set the vibe for the main event – the student story slam. When it was time for the young students to bravely share their original poems, their courage was awarded with thunderous applause. The day concluded with a rousing performance by Concordia’s Acro-tumbling team , a final prayer led by Senior Vice President at Concordia, Gretchen Jameson, and a parting challenge for students to leave the event empowered to make a difference and encouraged to use their spoken words to affirm the worth and dignity of others. For more information, please contact Rebecca Hasbani at: Rebecca.hasbani@cuw.edu or Professor Tracy Tuffey at tracy.tuffey@cuw.edu. — Lisa Liljegren is assistant vice president of strategic communications within the Office of Strategy and University Affairs. April Is Occupational Therapy Month—How Will You Celebrate?